Can Astrology Predict Stock Market Trends? If you are wondering about this, then you have arrived at just the platform you need to be. We encountered ourselves with this question a decade ago. And, we hit the roadblock as ecosystem of Astrology was not of the nature to provide predictions for Stock Market in the form it was readily available. However, we have had the luxury of having some of the best minds in the Vedic Astrology to redefine this space and provide tangible outcomes. Here we intend to share the story of our journey to invent the mechanism to provide accurate predictions for Stock Market. It started in 2006 when we decided to take this challenge and deliver against the odds. 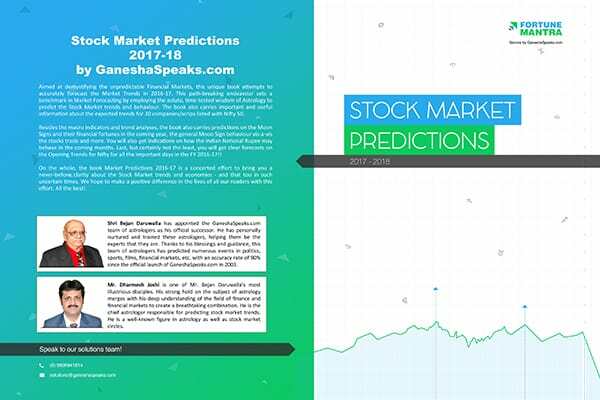 During the analysis phase which expanded for 3 years, we rolled out a personalised book based on the Nifty and other Stock Market predictions. In the initial phase our prime focus was to collect the feedback of the end users and enrich the product to have over & above accuracy to support real-time decisions that traders must make in their day-to-day life. Post 3 years, we launched a full fledge product with over 90% accuracy. The personalised book of FortuneMantra was fully equipped to derive total value purely based on the Vedic Astrological methods. Yes, it includes predictions for Stock Market, Nifty and Trends that are suited for your birth-chart. But this is break-up that will provide detailed insights of why every penny spent for this Personalised Book is worth it. The Beginning of the financial year is the just the perfect time to enroll and get yourself the much-needed boost. Order today and make informed stock-market decisions for the year.